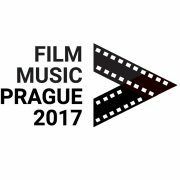 Film Music Prague celebrates its 5th edition this 2017. 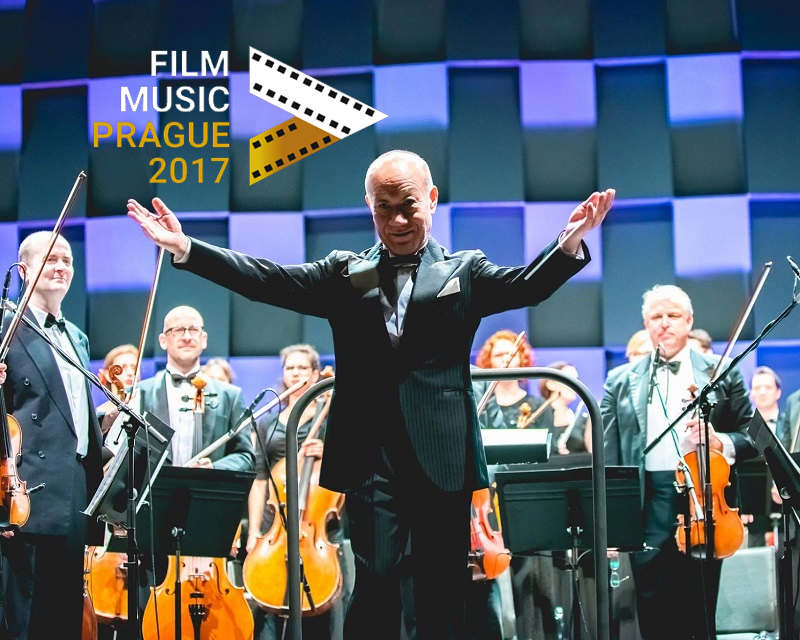 An European film music festival that has been growing slowly with a firm pulse, and that this year has managed to be placed in the podium of honor of the festival circuit with their guest star, the great Japanese composer Joe Hisaishi. 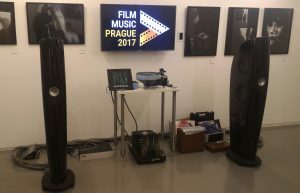 Over 4 days and 3 nights, Gorka Oteiza (SoundTrackFest) visited Prague and has prepared this summary article of the festival, which includes an interview with its director Nikola Bojčev, where he tells us about his opinion on this year’s festival and ideas for future editions. First day at Film Music Prague and first day in Prague, so at midday I approached the Festival Centre in the building ČSOB inspirace, to collect the program and get additional information of the festival. I had the opportunity to visit an area that had been prepared expressly in the basement gallery to listen to soundtracks called “440 Audio: Relax Zone“, where you could see a great hi-fi sound equipment of the best quality, playing soundtracks from vinyls with a DJ in charge of the selection. On one side of the basement there was an exhibition of figures and posters of Alien, aligned with the theme of the second concert of the festival. A humble and simple, but practical and effective festival office. Later I attended the rehearsal that Joe Hisaishi was having at Smecky Music Studios with The City of Prague Philharmonic Orchestra, rehearsals that would be supervised very closely by veteran James Fitzpatrick, acting as the oil in a complex machinery composed by many people, so that all the sessions developed smoothly and without setbacks. The truth is that it is surprising to see in the rehearsals how as a piece that has been interpreted at first sight by the musicians (in most cases it is the first time they see that score), sounds great from the beginning, and how with the instructions that Joe Hisaishi was transmitting to the orchestra, that piece is gradually polished, like a sculpture in which the details appear as the chisel is applied. 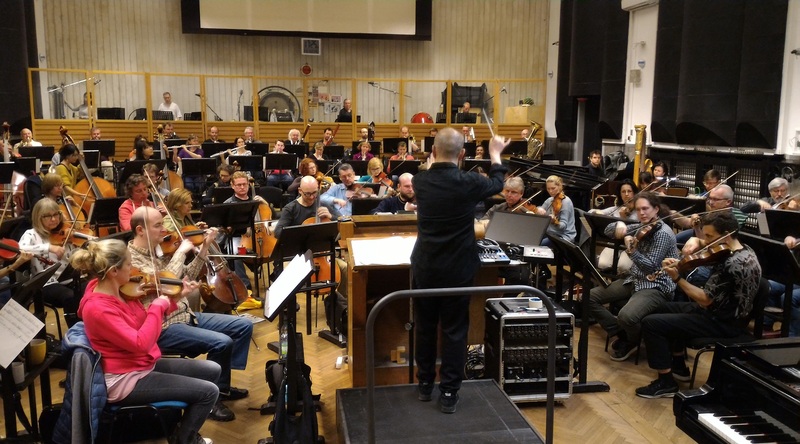 This confirms something that we have all known for a long time, and it is the great technical and professional quality of the City of Prague Philharmonic Orchestra. 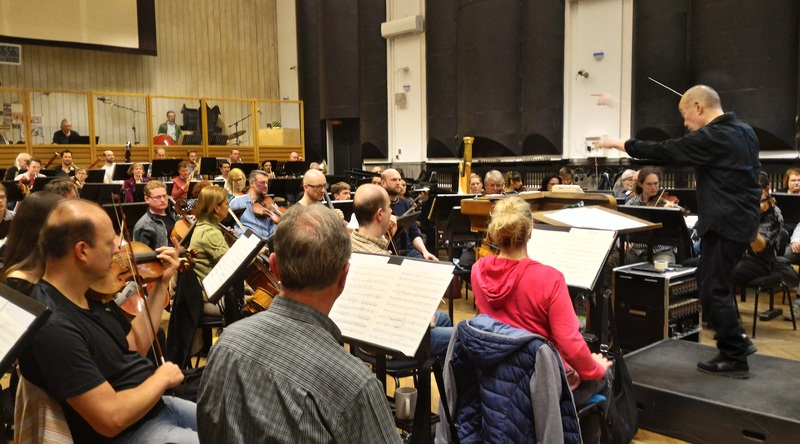 It is a luxury to be able to see firsthand the process that the music follows since it is first played by the orchestra, until it reaches the final concert version two days later. And it is another luxury to be able to see closely maestro Joe Hisaishi conducting and explaining his music to the orchestra. 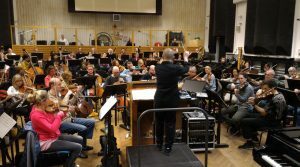 Once the rehearsal was finished, it was time for the first concert of the festival called “A Love Story“, dedicated to the music of the Scottish composer Craig Armstrong. 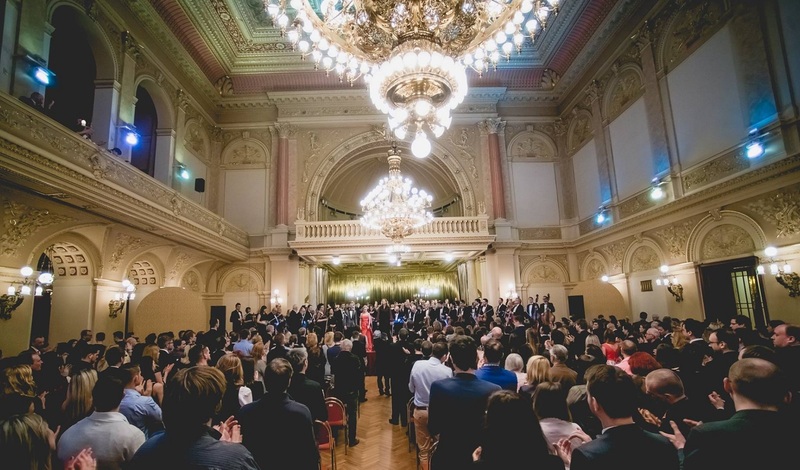 The concert was held in a privileged location, the Zofin Palace, located on a small island, one of the many that populate the Vltava River as it passes through Prague, and easily accessible by a bridge that connects it to the old part of the city. As soon as you entered the building and climbed to the first floor, doors opened to a large open hall, where comfortable chairs were placed in rows facing a raised stage. With an approximate capacity of 800 seats (according to information on the website), the concert was sold out since the previous day. A big success, considering the particular thematic program that was going to be performed. 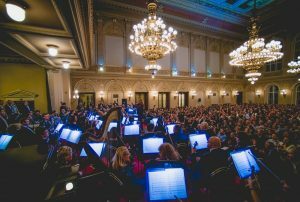 Some minutes after 8 pm, the concert started with the Prague Sinfonietta & Vox Pragae under the baton of Miriam Nemcova, with the participation of soprano Christina Johnston and the singers Martin Chodur and Tereza Cernochova. The evening began with a strong and intense performance of Romeo + Juliet – O Verona by the orchestra and choir, quite brief, that gave way to a second softer theme, Balcony Scene, where soprano Christina Johnston showed the fabulous power of her voice. Next, a succession of themes from Perfume: The Story of a Murderer was played, correctly performed by the orchestra, but where you could appreciate one of the weak points of the night: the amplification used was not quite adequate for the venue, as there were slight echoes and the voices of the singers or the sound of the piano, were a bit faded, despite the good conducting of Miriam Nemcova, who balanced the sound of the different sections of the orchestra. Following, two love songs from Love Actually were played, which were delicious in their interpretation and contributed, along with the next theme World Trade Center – Cello Theme, to one of the orchestral highlights of the first part of the concert. Before the intermission, the symphony recreated by Gene Pritsker for Cloud Atlas – The March was performed, which was sincerely weak, not in its execution, but in its approach, with a reinterpretation that drowned the main melody in elaborate orchestrations, without letting the central leitmotifs of the soundtrack shine, and that was constantly generating tension and raising the tone of the music, but without resolution. And so when an hour of the concert had passed, a half an hour intermission came, to continue later with two songs from Far From the Madding Crowd providing a great beginning to the second part, and continuing with the strength of Elizabeth: The Golden Age and some very successful choirs that elicited a good applause from the audience. Relaxing slightly the tension of the previous piece, Snowden – Moscow variation was played, where the soft but intense interpretation of the cello stood out, preparing the atmosphere for the block dedicated to Moulin Rouge!, main course of night. In four themes, soloists Martin Chodur and Tereza Cernochova built a musical dialogue containing the whole essence of the movie Moulin Rouge!, where the piece One Day I’ll Fly Away could be highlighted, beautifully performed by Tereza Cernochova. It’s a pity that the amplification of the soloists was not adequate, being partially eclipsed by the sound of the orchestra (despite the good work of the conductor); although it is true that this did not diminish the joy of their fabulous voices and a great thematic block of Moulin Rouge! which was fantastic. Getting to the end of the night, The Great Gatsby and Victor Frankenstein were played, officially closing the concert, but after a great round of applauses from the audience, a powerful and strong encore from Moulin Rouge! was performed. 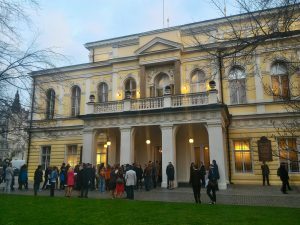 At 10:30 pm the concert ended and Craig Armstrong approached the stage in the middle of the applause of the audience, where microphone in hand, he thanked the organization for dedicating almost a complete concert to his music, in a privileged location such as Zofin Palace. 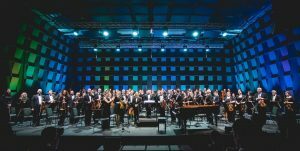 With a program that clearly sought to offer something different to the audience, and that managed to surprise and please equally, the first night of the festival ended with a very good impression, and leaving us expectant of the next two concerts. Today, Craig Armstrong‘s panel / conference was held at the festival’s central office from 2:00 p.m. to 3:00 p.m., which unfortunately I could not attend, although the references I had were that it was very interesting. A pleasant and relaxed Craig Armstrong spoke about his work, his creative process, his collaboration with several directors, and all of it seasoned with funny anecdotes. 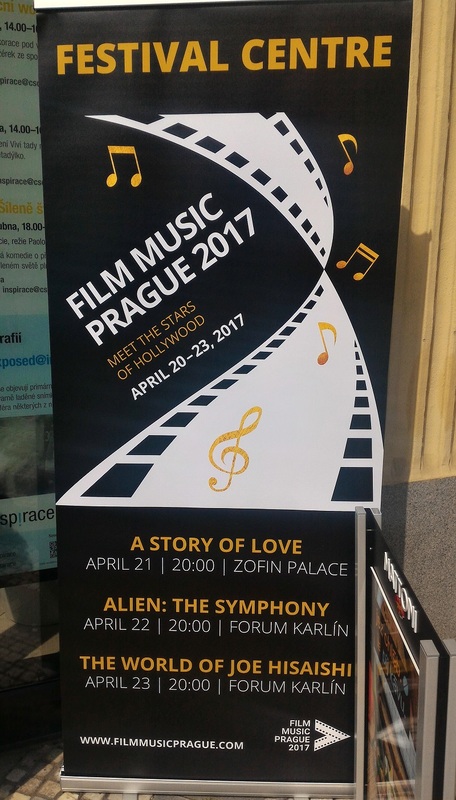 At night, the second concert of Film Music Prague was held, named Alien The Symphony, a concert based on the music of the films of the Alien saga, very trendy at the moment with the premiere of Alien: Covenant round the corner. 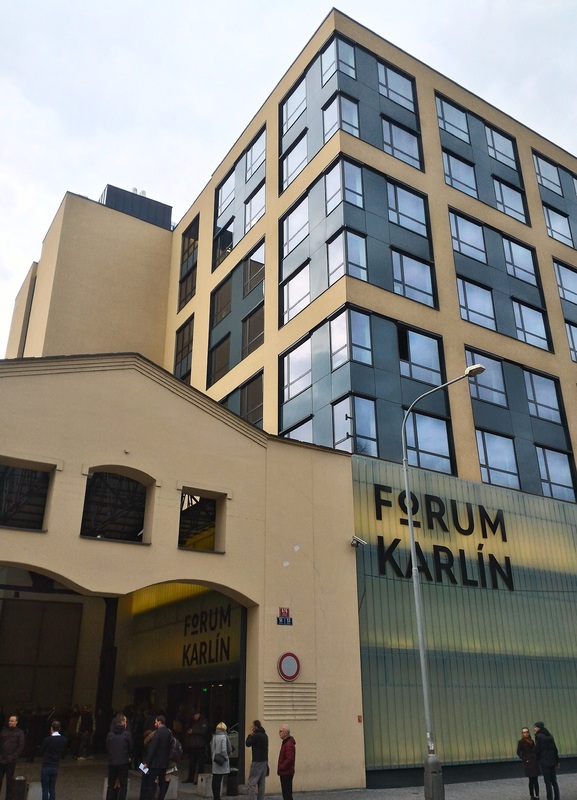 The venue chosen for the last two concerts of the festival was Forum Karlin, a modern building that housed a concert hall on the ground floor, with an approximate capacity for 2,000 people (according to the official website), which was almost full. The concert began at 8:10 p.m. and was performed by the young Filmova Filharmonie Orchestra conducted by Chuhei Iwasaki, with the participation of the Kühn Choir and the Boni Pueri Boys Choir. With a good acoustics and a sound that allowed to appreciate the nuances of the orchestra and the choir, the first part began, with the orchestra performing beautifully Alien Resurrection – Main Title (John Frizzell) that started the concert intense and fast, to give way to a somewhat light version of Prometheus – Main Theme (Harry Gregson-Williams), that was just correct. While the orchestra played the pieces, computer-generated 3D animations were projected onto a large screen over the stage, in order to accompany and try to evoke sensations related to music, although they did not often achieve the desired effect. Visually it was a dazzling show, although in general the images did not contribute much to the music and sometimes even distracted in excess. On the other hand, the light effects on stage, which were synchronized with the pieces, did achieve a higher level of immersion and depth, providing an environment of light, color, coldness or nervousness, according to the rhythm and tone of what was being played. But continuing with the program of the concert, the time of a suite of themes from Alien 3 by Elliot Goldenthal came, which was not a real suite prepared for a concert, but a succession of pieces played one after another. This caused some confusion in the audience, applauding on more than one occasion thinking that the suite was over, when in fact, it was a brief pause before the next piece. Even the director addressed the public once indicating to wait, that the “suite” was not yet finished. I think that the screen could have been used to show what was being played and to introduce the pieces to the audience, which would have generated some more cohesion in this first part. Anyway, when we were on little more than half an hour of concert, the intermission arrived at about 8:40 p.m., catching everyone by surprise with the brevity of this first part. A short first part and somewhat musically hard to digest (especially the block of Alien 3), which disconcerted both in its execution and its approach. After 9:15 p.m. the second part started, this time without a choir, only with the orchestra, with the handicap of trying to win back a public that had been a little lost, and that was expectant for the final outcome of the evening. The first block was dedicated to the music of James Horner for Aliens, where with a steady rhythm and a great cohesion, the orchestra managed to convey all the nuances of the original score, including the complicated rhythmic, sharp and metallic part that was performed perfectly by the percussion section with the support of the brass section. The second block was dedicated to the music of Jerry Goldsmith for Alien, where once again the orchestra managed to impregnate the music with the coldness of the space and the suspense the score required, with arrangements that marked the presence of the brass section in a very correct way. A very good interpretation from the orchestra in both blocks, under the intense direction and always watchful eye of Chuhei Iwasaki, who gave precise instructions to the different sections of the orchestra, and who took a deserved applause from the audience. And when it was 10:00 p.m., we arrived to the first and only encore of the concert, which was curiously written in the program, and that was Brian Tyler‘s short main theme for AvP: Requiem. Once finished, and with a public applauding and asking for an additional encore that didn’t come, the evening ended, in a concert that managed to correct in the second part, the bittersweet sensation left in the first part. 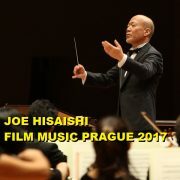 It was the last day of Film Music Prague festival, and the best was left for the end (as happens with desserts at a meal): The World of Joe Hisaishi concert, dedicated entirely to the music of Japanese maestro Joe Hisaishi. 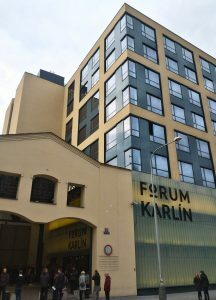 The concert was held again at the Forum Karlin, which we had the opportunity to visit the day before, and which was completely full with sold out tickets. At 8:15 p.m., the City of Prague Philharmonic Orchestra, which was to be conducted by Joe Hisaishi, arrived on a stage that did not have a screen in which to project images or videos, and with a repertoire that was not going to be supported by choir, although it did have the participation of soprano Christina Johnston in some pieces of the second part. 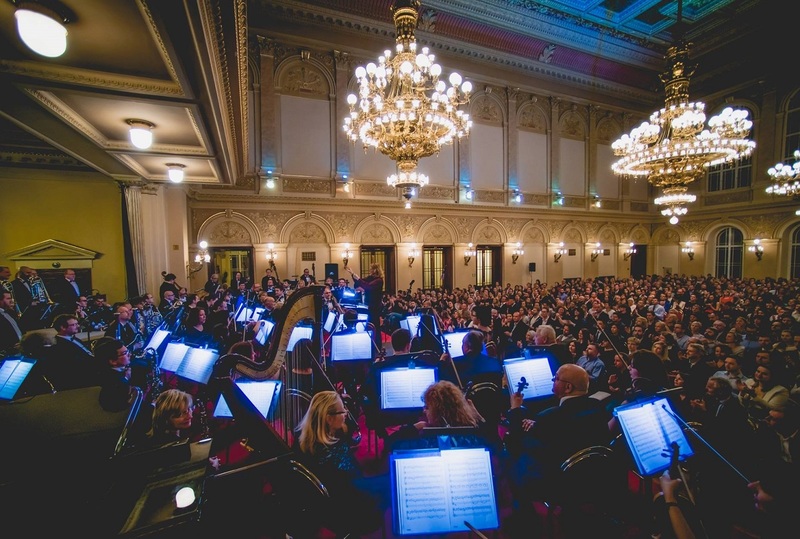 A pure orchestral concert, where the imagination and the nuances of music were going to shine. The concert started with Water Traveler, which had a soft introduction, followed by all the symphonic force of the orchestra, showing the energy and the sound that the orchestra was able to offer under the baton of the composer. A perfect performance both in tone and tempo, in a majestic suite of almost 13 minutes that debated between subtlety and intensity, and which was received with a great round of applause warming the atmosphere of the night. At this point, and looking closely at the positions of the orchestra, one could see that the distribution chosen for the string section was not the usual, since the violins and violas had been placed on both sides of the conductor, with the cellos in front and double basses in the center-left, obviously looking for a different sound. The next theme was Castle in the Sky, where a solo trumpet, located in front of the stage to the left of the director, took the weight of the piece. A set of question-answer musical blocks between the trumpet and the orchestra, gave a delightful theme of almost 8 minutes, and made the soloist’s lungs tremble, projecting all his energy without fainting a single moment. Sublime interpretation of the soloist and fabulous piece that had a deserved ovation of the public. To finish the first part The Tale of the Princess Kaguya – Symphonic Fantasy was played, a suite of 16 minutes approx., which brought a fascinating traditional Japanese sound to the concert, where the woodwind section emulated the song of the birds at times, the nuances of the strings transmitted the sounds of the forest, and the percussion, synchronized and very precise, gave the necessary rhythmic part to the suite. I’d like to emphasize a section of the suite dedicated to the theme “The procession of celestial beings” that lasted about 2 minutes, where Joe Hisiashi smiling and moving the body as if he was dancing on stage, marked the exact and continuous rhythm that had to be carried by the orchestra. At the same time, funny pre-recorded sound effects were played through the speakers of the hall, complementing and giving a new dimension to the performance. Stunning! When a little more than 40 minutes had passed since the beginning, and after a thunderous applause, it was time for the intermission, to resume the concert at 9:25 p.m. but this time with a new distribution. The director’s pulpit had disappeared and his place was occupied by a piano, where Joe Hisaishi, sitting facing the string section of the orchestra and with his back to the audience, was going to play and conduct at the same time some pieces for piano and strings. This part was dedicated to the music of several Takeshi Kitano’s films: Kikujiro, Hana-bi and Kids Return, and was accompanied by the complicity and prominence of the great orchestra concertmaster Lucie Svelhova. It should be noted that Joe Hisaishi is a great pianist and it is a luxury to be able to have him playing live, although there were some moments of his interpretation that were not all the precise that they should be, apparently due to an injury in his hand that did not allow him to move through the piano with agility. After finishing this block, which lasted about 13 minutes, a brief stop was made to move the piano a few meters to the right, reposition the pulpit of the director, and add the sections of wind and percussion of the orchestra again. And then came the best moment of the night, Princess Mononoke – Symphonic Suite, which started with a dry but firm percussion to incorporate the strings and melody later, but that within a few minutes, forgot the melody to give way to a disturbing and conflictive section, with a rhythmic metallic percussion creating a base of tension, which was reinforced by the beatings of the string section and the strength of the brass sections. When we’ve had about 10 minutes of the suite, the tension relaxed with a very soft percussion and a sweet woodwind section, giving way to the voice of soprano Christina Johnston, who gave us a sublime interpretation in English of the main vocal theme of the soundtrack. Afterwards, the orchestra continued with the suite, while Joe Hisaishi played the piano again, first solo and then accompanied by Christina, to continue developing the suite until its glorious end. A total of about 27 minutes of wonderful suite, in the most balanced, and best interpretation that I’ve ever listened in a suite. When it was already 10:10 p.m., a standing audience kept applauding asking for more, a wish that was granted with an encore: Nausicaä of the Valley of the Wind (Kaze no Tani no Naushika) – The Bird Man, which began with the orchestra developing the theme, to later incorporate the ability of Joe Hisaishi to the piano. Fabulous! And so, with another almost endless wave of ovations and applauses, and with an audience that wanted a second encore, ended the concert 2 hours after its beginning. One of the best concerts I’ve ever attended. Plain and simple. The perfect balance of the pieces chosen for the concert, the luxury of having Joe Hisaishi playing piano, the pieces of Kitano’s movies for piano and strings, the fabulous voice of Christina Johnston in Princess Mononoke’s suite, or the perfection of the performance of the City of Prague Philharmonic Orchestra throughout the concert, were more than enough ingredients to reach this conclusion. Once the concert ended, a good group of fans gathered on the side of the stage waiting for Joe Hisaishi to appear to take a picture with him or have a signature. 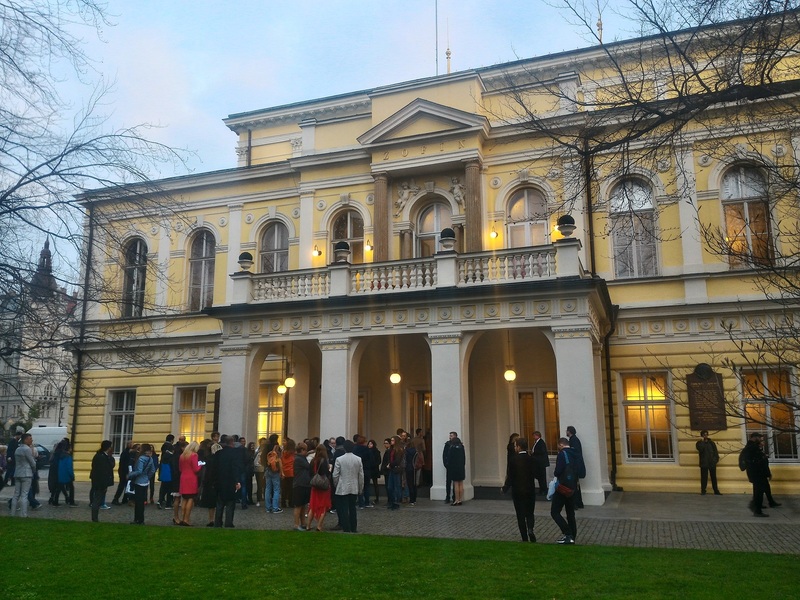 After a while waiting, it was announced that he would not come, but minutes later and already outside the Forum Karlin, the composer appeared by chance on a side door, on his way to the car that was going to transfer him to the hotel. There, he had no problem standing patiently in front of a group of about 20-30 people who gathered neatly, and attended all the fans without leaving anyone without his photo or his autograph. And finally, a confession: when the maestro was about to leave for the car, he indicated that if everything goes as planned, in addition to the concerts next June in Paris, in 2018 we will be able to enjoy again his music in Germany. ¡¡We’ll be looking forward!! 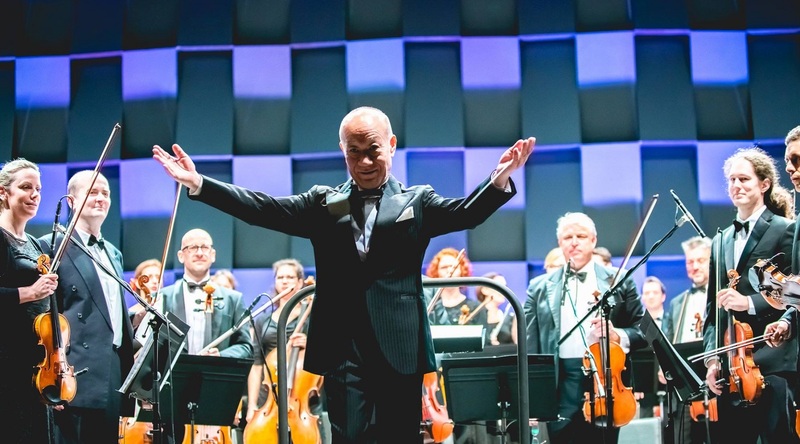 It is difficult to write a summary of Film Music Prague festival, and not being overwhelmed by the incredible concert offered by Joe Hisaishi with the City of Prague Philharmonic Orchestra … but here are the pros / cons, as always, in a positive way. The sound system in the concert at the Zofin Palace was not quite adequate (something that was especially noticeable with the singers) and it would be advisable to adjust this aspect for future editions, although trying to maintain the place, which has a certain charm compared to a modern concert hall. The visual effects of the Alien Symphony concert were correct, but they were not very successful, and the format would need to be redesigned to find a way in which they are more integrated with the concert. The main office of the festival along with its audio zone, where you can listen to soundtracks in high fidelity equipment, turned out to be an interesting place, also with the conference and the exhibition of elements related to the Alien films. It is an area that should be promoted for future editions with parallel and complementary activities to the concerts. 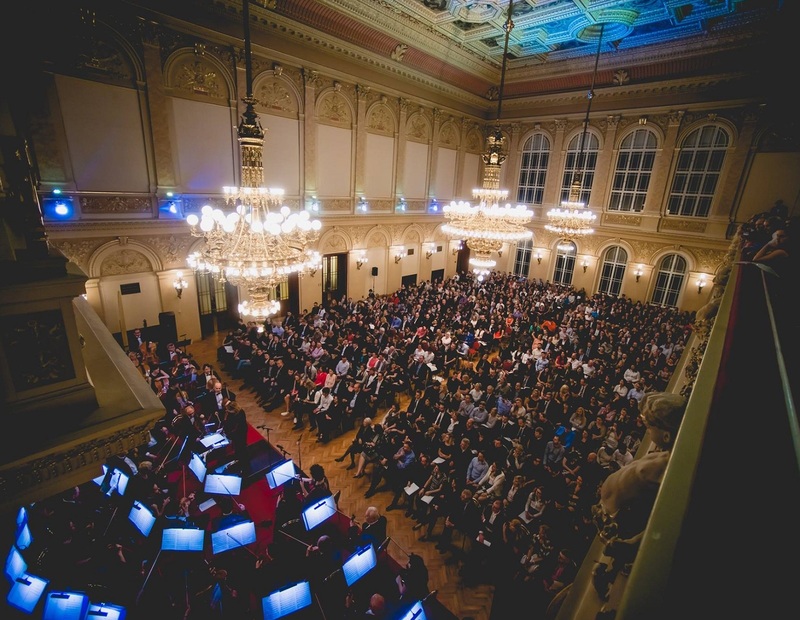 The conferences allow a greater interaction between the public and the composers, giving the author an opportunity to comment on his work and to give many details about the creative process and the anecdotes that accompany it (although in this case it was only possible to have a conference with Craig Armstrong). 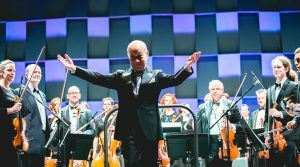 The City of Prague Philharmonic Orchestra is a veteran orchestra that has been in countless concerts and soundtracks recordings, and this could be noticed in Joe Hisaishi‘s concert, which was perfect. If it is not the best concert I have ever attended, it is very close, as I already explained. 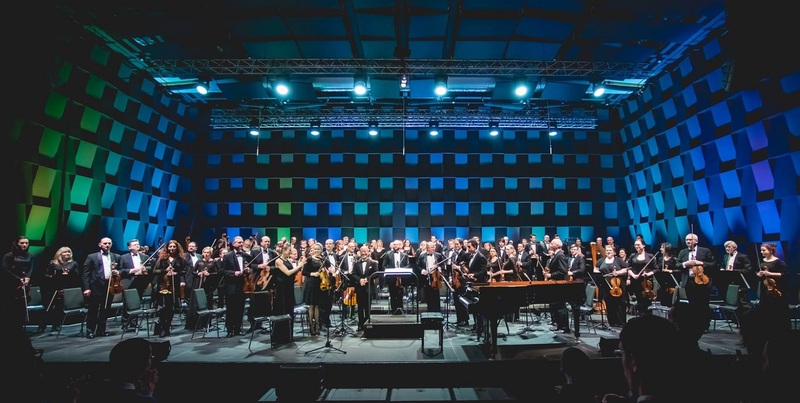 The festival is already in its fifth year, showing maturity and a powerful personality, offering three varied concerts that can attract different types of audiences, with diverse and brave programs, which also had a great quality in their execution. 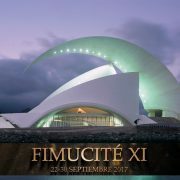 The quality increase and the evolution the festival is experiencing year after year is great, and if it follows the current trend (which I’m sure will do), 2018th edition will undoubtedly be a success, as well as an essential event on the calendar of European Film Music Festivals. First Nikola, thank you very much for having SoundTrackFest in your festival. 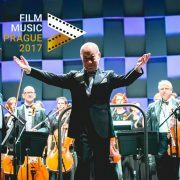 Spanish people has been asking a lot about Film Music Prague lately, so I think they’ll be interested in this interview with you, the director of the festival. For people who don’t know you, could you introduce yourself? What do you do, what’s your role and where do you come from? In 2010 me and some friends attended David Arnold’s concert in the Royal Albert hall, the “Concert for Care”. 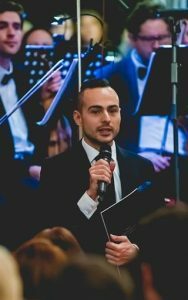 It was a concert shared with other top British composers. It was a very good and very long concert, almost 3 hours, and it was our inspiration to do something in Prague. We decided to do our first concert in 2011 with Rachel Portman and Jan A.P. Kaczmarek as special guests. That year is when we decided to prepare film music concerts every year. Maybe I was the father of the idea, but I encouraged all my friends around to be involved. We didn’t know that in the next 5-6 years we would grow up so big with a 3 or 4 days program like this year. This is not really my job, I’m not a professional producer of film music concerts or cultural events, I’m journalist in Czech Radio and I’m doing this festival in my free time. Yes, it’s good to be a journalist because I have a lot of contacts and also I’m a film music lover, so, if you mix all those things, this is what happens! It’s a very good base for building something special. I know very well this industry because I have contacts from other festivals. I’ve attended festivals like Krakow, Hollywood in Vienna and others. How did the festival evolve from the first edition? You said it started with one concert and now you have many concerts and even a panel. Do you have new growth ideas for next editions? The process is very complicated. We want to offer something that has never been produced; we are not copying any projects. Alien The Symphony for example. Some people have told me it was already done in Fimucité, but the program is different, and also the special effects and light effects were prepared as a multimedia show especially for this concert. Originally we wanted to do more visuals, but after a long discussion we decided to focus more on music, as it’s still a film music festival. Last year we decided to do a big festival. The previous years we did a big concert on the beginning of the year, one concert in autumn, one in winter… but we were tired, as we had to organize concerts all year round, working on programs, promotion, creating ideas… So now we’ve decided to do all together and we have more time to do something special. After this edition first we’ll take some rest and then we’ll start to create new ideas. Some ideas we already have, but it takes time to think about them and receive feedback from this year, as it is very important to receive feedback from the audience. We know this year the festival has been quite successful, but we have to get reports yet of the concert venues, to decide if we keep them or change them. This year’s main guest was Joe Hisaishi. A very renowned composer and a great name for the festival. He gave a magnificent concert, with the City of Prague Philharmonic Orchestra. He was announced on January (if I’m not mistaken), when you already had Craig Armstrong who looked like he was the main guest. How was the process? How did you get him to come to Prague? Well we were lucky with Craig. We tried to invite Craig Armstrong a couple of times, because me personally, I’m a big fan of his music. It’s different, he has his own style. So last year, during summer, we received a “maybe it’s possible to attend” from his assistant, and we decided to focus on some emotional program. We were not sure if Craig had music ready for a whole concert, so we decide to do a “Love Story” concert, because Craig wrote very nice love story soundtracks. At the end we realized he has a lot of music prepared for a complete concert, so we decided to dedicate this concert to his work and add two more pieces. We wanted to invite Tom Tykwer director and composer as well but he was busy with some TV series post-production. So we decided to complement and play Perfume: The Story of a Murderer and the Cloud Atlas music. But for what we saw yesterday, looks that the programs are going to be quite different. That’s true and we are quite surprised that the audience liked a different program, because honestly, Joe Hisaishi is well known for his Ghibli movies. I think Prague program was great, because it includes Kitano’s movies as well. Maybe my favorite piece is the suite of Princess Kaguya, very typical Japanese music. We missed the opportunity to have a panel with Mr Hisaishi, so he could talk and explain to fans more about his music. Only one panel with Craig Armstrong was held during the festival. People like this kind of complementary activities to the concerts. Do you plan to promote and strengthen these activities? I think the panels and discussions are a very important part of the program and it’s what we want to do in the next editions. As you said, unfortunately Joe Hisaishi didn’t have time for it. 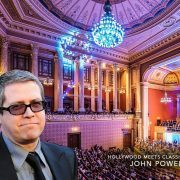 He arrived just before first rehearsal; he’s been here for two days, rehearsing, and he wanted to focus on the concert, so we accepted his decision and offered only a panel with Craig Armstrong, which by the way was great as Craig has a lot of stories to talk about. So panels are very important to us, and we’d like to offer more in the future. But panels are only one option. This year we had a listening area and a small Alien exhibition, but we also plan to open up to workshops, classes for mixing, editing, writing music… and many other things we want to do in the next years. If the festival wants to grow, we have to offer something more, not only concerts. Meeting with fans, interaction between composers and people; that’s what makes the festival interesting and makes good atmosphere. Yes. 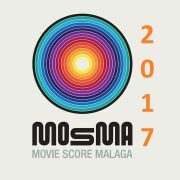 That’s something that I’ve noticed in Spanish film music festivals, that Composer-Fan relation is very close. Interaction is very natural, and that makes a very good impression of a festival. Yes, that’s true. I’ve heard a lot of good things about those festivals. 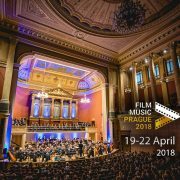 So 2018th edition of Film Music Prague is on its way. What can you tell us of next edition? I can say I have some ideas and I think we will announce something maybe during next weeks. If everything goes as planned (we’re waiting for some confirmations), we intend to keep this year’s dates. Well, I’ll be looking forward! Thank you for your time Nikola. And have a good rest. After this intense festival, you deserve it. (*laughs*) Thank you!! And greetings to all the Spanish film music fans. 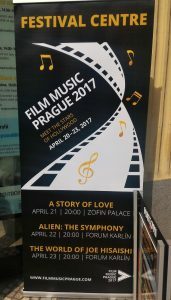 Film Music Prague is waiting for you!